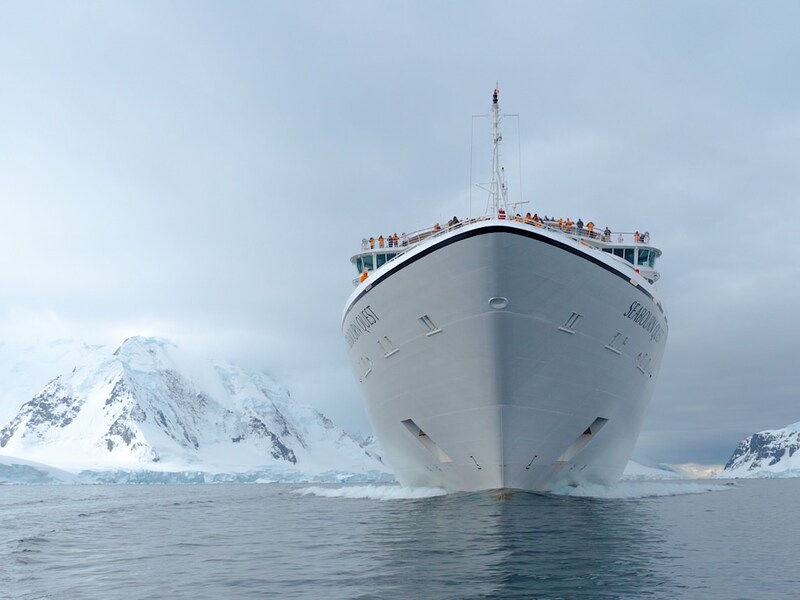 Seabourn Quest, Cruising Antarctica: Built in 2011, Seabourn Quest underwent upgrades in 2013 to prepare the vessel for Antarctic journeys. Among the upgrades: The ship’s hull was strengthened and Zodiacs were brought on board in order to conduct landings in Antarctica. Ships carrying more than 500 passengers are not permitted to offer landings to their guests. These ships offer so-called “drive-by” cruises, whereas Seabourn Quest delivers guests to shore each day on the flat-bottomed Zodiacs. Be sure to check out our review of Seabourn Quest. © 2014 Avid Travel Media Inc. The vessel that carried us to Antarctica: Seabourn Quest, launched in 2011 and, at that time, one of three new vessels that represented a radical design direction for Seabourn. You can find a comprehensive review of Seabourn Quest, as well as a dozen videos highlighting the vessel, by clicking on Avid Cruiser’s Seabourn Quest Ship Review. Just this week, Seabourn announced the names of its two new ships, Seabourn Encore to launch in 2016 and Seabourn Ovation to launch in 2018. Details on the new ships can be found at a new microsite, encore.seabourn.com. The new ships will build on the success of the Seabourn Odyssey, Seabourn Sojourn and Seabourn Quest, which were introduced between 2009 and 2011. Seabourn Encore and Seabourn Ovation will maintain the line’s high ratio of space per guest. Major differences from the Odyssey-class vessels: The two new ships will be configured with one additional deck and newly expanded public areas. The new vessels are expected to carry 604 guests each, based on double occupancy, and every suite will feature a private veranda. With the addition of the two new ships, Seabourn will have the youngest and most modern ultra-luxury fleet in the industry.